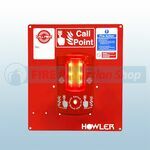 Fire Protection Shop now supply the Howler Site Alert RF, these alarms come with many features such as open air range of approximately 1km. Each system can have up to 30 subsidiary units connected to a master unit and with 8 different channels to give you plenty of scope. 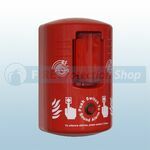 The Howler Site Alert RF is suitable for both indoor and outdoor locations due to its weatherproof design, powered by Alkaline batteries; ongoing maintenance is economical and easy.